The living dead are coming for you! Find a vehicle you can use before it's too late, step on the gas and never look back. 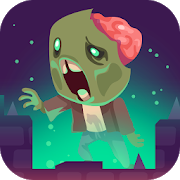 Can you keep your eyes on the road and avoid the hordes of bloodthirsty zombies? Aim for their brains and clear your way! Is this a simple shooter? We don't think so, but you'll have to play and check it out! Enjoy its smooth graphics and an amazing action-packed adventure. Make time slow down and obliterate your enemies while you keep running! Protect your home from these dangerous waves of yetis. Choose a weapon, aim, shoot and obliterate them all before they catch you!